Today is a topic very near and dear to my heart. Houseplants. Don’t stop reading!!! I know. Houseplants are either boring or depressing, or PTSD inducing (–as everything rushes back upon recollection of the tragic tale involving the orchid from Great Aunt Martha and the guilt that still haunts to this day. I know. It was awful). 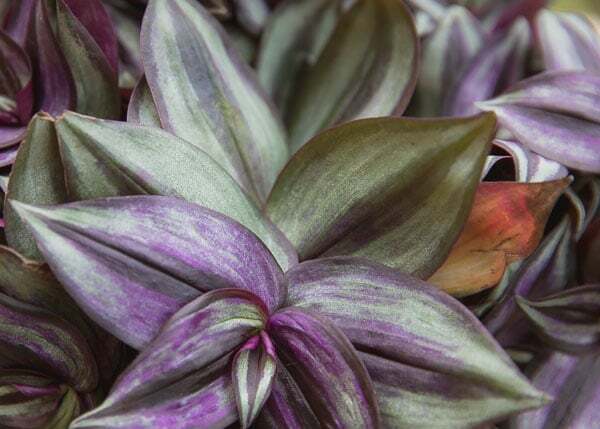 But it is national houseplant week and I would be totally remiss as a blogger to not pass on my rather limited but passionate knowledge of houseplants. First. Stop trying to grow succulents (those are cactusy plants like aloes, jades, Christmas cactus, money trees, and those funny ones with some bright thing glued to the top), especially from the local grocery store or Home Depot. They are seriously the worst. I keep a few just because, but honestly, they always look pretty pathetic come March and can’t wait to go outside for summer. Thankfully, they do perk up after a summer outside but do not think for one second that because you failed at a jade, you will fail at every house plant. This is the year to fill your house with fresh oxygen all winter long! This is your chance to make a new houseplant story (because who doesn’t like a good houseplant story?!)!! Spider Plant (bottom left) — These things are nearly indestructible. They need bright light but not direct sun and they need to be watered every once in a while. I try to water it once a week but I’ve forgotten for a whole month and it is fine. We got ours as a wedding gift from a friend who I pretty much haven’t seen since. It has produced hundreds of babies and its ancestors are living all over the place. If you need one, let me know and I’ll save you a baby from the next batch. I see about 8 growing right now. 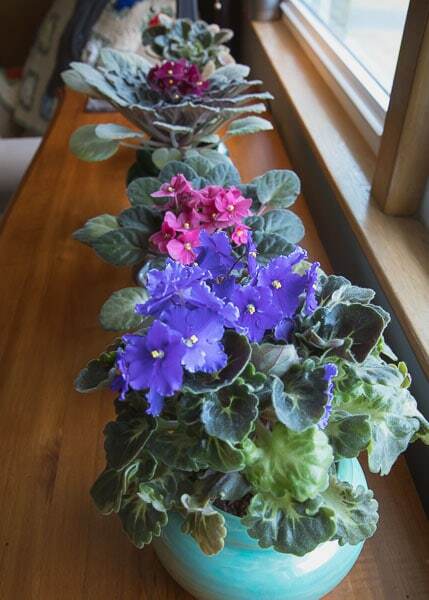 African Violets (right side) — The key to a violet is to get a self-watering violet pot. It is basically 2 pots, the pot with the plant nestles into the pot with the water. 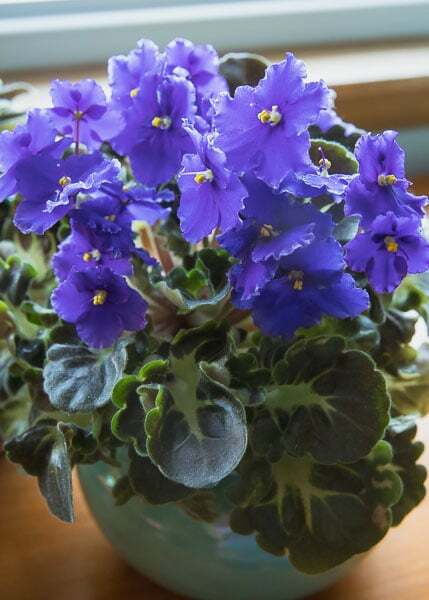 Violets like to be watered from the bottom and you simply refill the reservoir whenever it gets low. They come in a variety of purples, pinks, and whites. 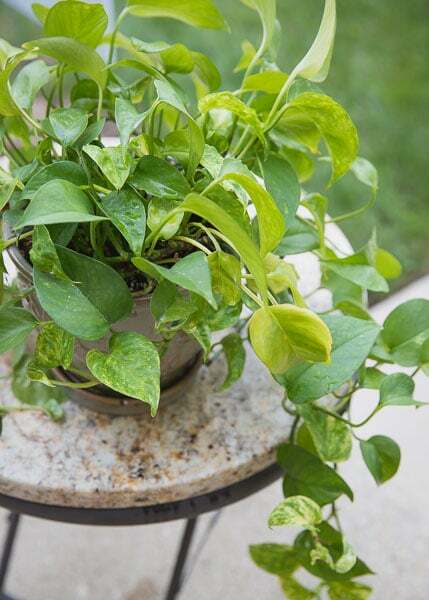 If you water it too much or too little or from the top, sometimes leaves will get all soggy and brown and need to be taken off, but mostly, it just grows along happily. I don’t really bring my violets outside. They told me that they like it better in the house. Pothos (bottom right) — That viney plant that always hung from mom’s macrame in the 80s. I have a love-annoyance relationship with these guys. They are easy to grow until they aren’t. If they are in the right spot (relatively low light with no direct sun), they keep getting longer and longer, but if you forget to water them, they start losing leaves and get kinda ugly. It isn’t a huge deal. I then cut off all the ends and put them in water and after they root, I start a new plant. I like them. I always have them in my house, but they just aren’t the best. 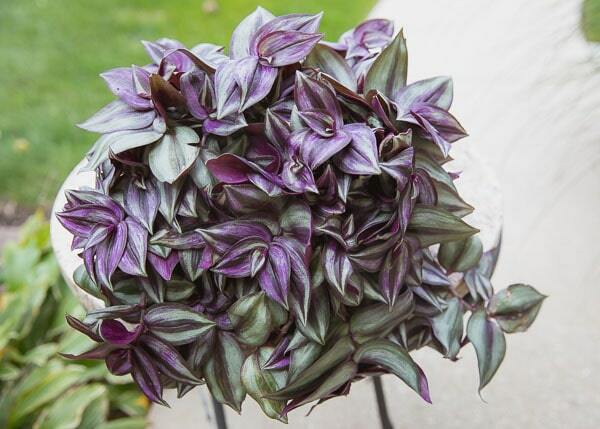 Wandering Jew (top left) — I’m adding that one because I think the name is funny. And the plant is GORGEOUS! It is variegated purple and minty green and glitters in the sun… It needs lots of bright light and they are kind of pricey for a beginner. But I love them. Bamboo (not pictured) — Bambo just needs to sit in water. That is it. No care. No thought. As long as there is always water in it, you can’t go wrong. You can pick up bamboo at IKEA or Chinatown. But if you just want a plant. This is probably it. Moss or Ferns — If you have a kid that LOVES to water plants, these are a great option. They like to be wet all the time. For a grown adult who has a lot of other things on their plate, this isn’t practical… but for a child who wants to water 100 times a day, it is great. And the moss is squishy. I mean come on, who doesn’t like to pet moss! (probably people who have an actual furry pet — but since we don’t… moss is the next best thing… and FYI… we are allergic to EVERYTHING and standard houseplants don’t bother any of us). Kids love watering plants. I keep a spray bottle by the plants and the kids couldn’t wait to walk around watering. It works well on anything but the violets. 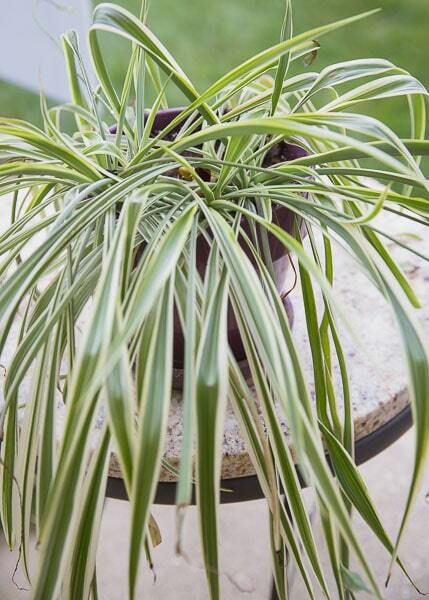 Keeping houseplants is great for the air in your home. I know it is a little obsessive, but we have one in almost every room of the house. My husband has a window ledge packed with houseplants in the high-school classroom. If he can keep them alive, so can you. His are watered with whatever he pulls out of the dehumidifier. Houseplants don’t mind a watering can, but the best way to water a houseplant is to carry it over to the sink and really soak it. I take some time to remove dead things and talk to it a little before putting it back. Maybe 4 times a year? Always get a nice big saucer. I like to over-water the plants and let the water sit in the saucer and soak up into the plant when it wants it. If you do get a succulent! 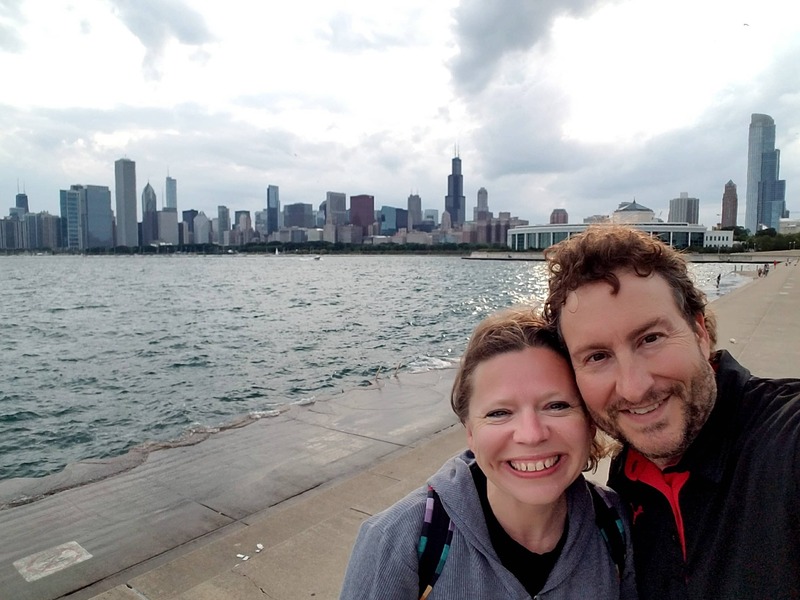 Word on the street is that they like one ice-cube a week. This seems very unscientific… but it is probably better than my random watering plan. If you are going to work past the PTSD and try an orchid… they are AWESOME. And not that bad. Bright light but not direct sun. Soak the root part in water and then after about 30 minutes, dump out the water. I do this about once a week and mine bloom all the time. In the summer, take your plants outside to a covered area where they won’t get direct sun or wind. The plants get so happy when they are outside in the fresh air!! It is totally worth the risk of a few bugs. Try not to keep houseplants over vents. The constant dry air doesn’t make them happy. Grandma always talked to her plants and sang to them. I thought it was a little crazy. And maybe it was… but now I chat with them and they seem to really like it. And it is kinda therapeutic. Avoid trying to grow herbs as a beginner. I try them every single year and every single year I kill them. They just take too much time and love and they don’t taste as good as when they are grown outside. I’ve decided to embrace the dry herbs in the winter and anxiously await summer for fresh.